H. Hargrove has been producing signed and numbered limited editions since 1982. Some of Hargrove’s works have sold for as much as $12,000. You can own a piece of “Americana” by choosing from the images here. 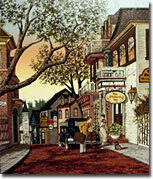 Our advertised paintings are listed by the year they were created. Click on the year to go to that page. If you want to buy a painting, click the price and you can send an email to the owner. If you want to add your listing, please follow the easy instructions on our advertising page. Copyright 1999-2011 HargrovePaintings.com All images are protected by copyright and are for the expressed use of sales from the artwork owner. It is illegal to download any of these images for reproduction or use on another site. Designated trademarks and brands are the property of their respective owners.